This page brings together the additional virtual galleries as well as print-on-demand services through which it is possible to purchase prints of artwork by Gilbert Spencer. Bridgeman Art on Demand – Prints can be purchased through their art-on-demand service: Please click here to visit the website. 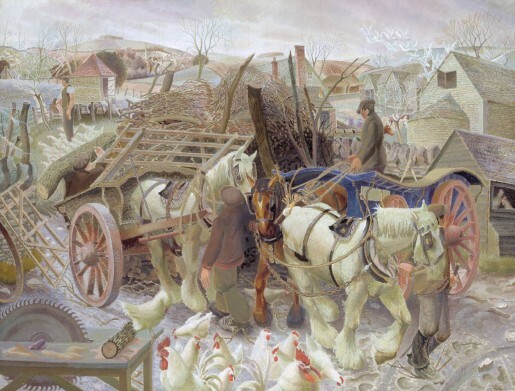 Tate Gallery Fine Art Prints – The Tate Gallery has their own art-on-demand service where it is possible to order prints including ‘A Cotswold Farm’ (featured on this page). Please click here to visit the website. Royal Academy of Arts – Gilbert Spencer was a member of the Royal Academy, and it is possible to purchase fine art prints of Gilbert Spencer’s art through the print on demand service. Please click here to visit the website. National Portrait Gallery (NPG) – If you are an art historian the National Portrait Gallery has a series of vintage photos of the Spencer family taken in the 1910s and 1920s. These can be consulted online, and prints can be requested using the NGP’s online service. Please click here to visit the website.